Alright, we are getting into the stretch the next 2 weeks. My thoughts...purely for recreational value! In the Santa Anita Derby, the 'Mousse' is loose over 'Pioneer'. The Arkansas Derby should see 'Old Fashioned' reestablish himself as a Top 5 contender, and 'Papa Clem' move up a couple notches. The Bluegrass Stakes is left with the bottom feeders of the Top 20, now that Friesan Fire is training up to the Derby. All of the Big Boys want to go on dirt. I'll take 'Terrain' by a nose over 'Hold Me Back' who may get held back. 15 TERRAIN Sky Mesa Albert Stall Adele Dilschneider Jamie Theriot 4/11 Bluegrass S. (G1) or Lex. 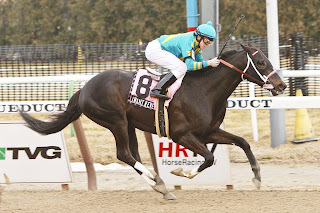 17 MUSKET MAN Yonaguska Derek Ryan Eric Fein, Vic Carlson Daniel Centeno 4/4 Illinois Derby or Wood M.